Two slightly knitting related comments. First, the basset sweater in action is viewable here. I think the baby's cuter than the sweater, honestly. I got an emailed picture of the two funky hats in use, too, but I think I'd better not post it without permission. (Hmmm, not that I got permission to link to the above, but I'm assuming it's OK? If not, let me know and I'll take it down.) It's very much fun to see things actually being worn, I've got to say. Also, last night I saw Wallace and Gromit: The Curse of the Were-Rabbit, which was deeply cute and funny. Apparently, not only am I often only 12 years old, sometimes I'm only 5 years old, too. Now, I've seen bits and pieces of other Wallace and Gromit outings, but not entire things. So I had no idea that Gromit knits! For some reason, I'm completely enchanted with the idea of this mouthless clay dog knitting. And especially that in this movie, he knits in the car, when he's a little scared. So frickin' sweet! The movie also gave me thoughts on gardening, which, since this is the first weekend I haven't felt like I had to spend every day working on academic stuff, is actually related to real life. Woohoo! More on that, later. Maybe. Unfortunately, I just had to chase Spud off the sweater. He seems to like to sprawl on top of knitted things I'm blocking/drying. Hence, I normally cover them with towels... but I walked away from the uncovered sweater for not very long, and he seized his chance. So the back's going to be a little cat hairy, although I tried to pick them all off. You know, the problem with being good and just trying to work my way through already started projects is that there's a lot less to say about them. I mean, I can report that I did another few rounds on my circle sweater, but that's it. I put it all on a few circular needles to measure its diameter, and found that it's still only about 22 inches in diameter. Each round is starting to take a long time (I think I'm at 256 stitches per round, and I'm about to increase another 8), so I think it's going to be slow progress from this point on. Or at least until I get to the sleeves. My new commitment to finishing what I start has paid off. The intarsia sweater I planned from its initial design is, mirabile dictu, finished. After another long day at the office, plus weed whacking upon my return home, plus actually cooking something tasty (fried rice), I somehow managed to finish off the second sleeve, weave in the last couple of ends, wash the thing, and it's now drying happily. The washing was a bit of a worry, as I was warned that this yarn tends to bleed. And it did, a bit, but not to a crazy degree. And after washing and rinsing once, I did the soak-in-vinegar-water trick, so hopefully it won't run too much more when its new owner deals with it. Or rather, its new owner's parents deal with it. I'm also not entirely sure if his (for some reason I've decided he's a he, although I have not given him a name) ears are quite big enough, but there you have it. And on the other hand, if I do say so myself, this view only shows part of the cuteness of this sweater. But its full splendor will have to wait, for the moment, at least. After the debacle with the light, and after eating some dinner (though not what I'd intended, which I couldn't make because the mushrooms I was going to feature went moldy... yesterday evening was not kind to me), I sat down to read a bit, then knit a bit. And what did I do? 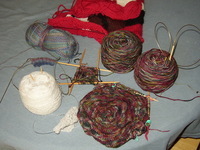 Did I pick up any of the three projects currently on needles? Did I figure out what I want to do with the neckline of the intarsia sweater? Did I knit a few more points of the edging for the Orenburg shawl? Did I work on the circle sweater? No. I started a sock, and then decided to start a second version of the circle sweater, this time in garter stitch. As a result, this is my array of works in progress. It's sort of misleading, of course. I will not keep going with two versions of the circle sweater, for example. I think, though, that I'm liking the garter stitch version better, although I'm not sure that I've quite got it right, yet. It'll make the sweater a little heavier, and I think it'll drape more nicely, too. I need to do a few more rounds on the sample, then pull out the needles to see if it's lying flat, more or less. And I may end up having to buy some new needles if it's not. The intarsia sweater's really close to done. I swear. Hmmm. Actually, that should probably be my next task, even though I think I won't be able to finish it without buying more red yarn. If the first version of this was too small, I think this one might be a little big. I generally figure that's not such a problem, at least for little kids, since eventually it'll fit. I may have made a two winter sweater, though, in that it'll be kind of big (maybe sillily big) the first winter, then more or less right the second. But. We'll see. The shawl's just something to be worked on when I feel like it. I think it's going to be a WIP for a loooong time, a fact to which I'm resigned. It'll be a good airplane project, though, because for now, at least, it's so very small. And the sock(eventually -s) is also something to be done around other things, I think. Something easy to carry, and easier to keep track of than the shawl. This is yarn I picked up at the wool market just because I thought it was pretty. And it is. I'm doing a fairly basic sock, though with mock cable rib for the top because I really like that stitch. I've also mentally planned two more sweaters, though I haven't yet sat down to figure out how I'll go about doing them in reality. And there are assorted other odds and ends to be dealt with. Such fun! Not just progress, the intarsia part's now totally done! I went to the knitting circle late this afternoon, which is always a good thing, because you get good pats on the back when something's going well, and good help when things aren't. I'd messed something up, so had to pull out eight or so rows of the back (and I'm actually still not sure what I did; I think I might actually have put the piece down in the middle of a row and started knitting the wrong way when I picked it back up). But then I finished the main body. Totally. Well, the knitting, anyway. So. Next task? weaving in all the damn ends. And, as obvious from the picture, above, there are a ton of them. Still, very doable. Then seaming one shoulder, the side, knitting on a neck/shoulder band (I'm going to make one shoulder button, so there won't be the problem of pulling a crewneck over a baby's head), and then the sleeves, which should go quickly, as I'll do them shoulder down in the round. I'm going to try doing them on needles one size up, as I tend to knit more tightly in the round than not. I also found a totally cool and wacky pattern in Vogue Knitting that I'm going to adapt to use with yarn I got at the wool market. It's the yarn in the middle on the left. Actually, it's the same single ply wool out of which I made the blue/mauve sweater discussed below. The pattern's a giant circle, with slashes out of which two sleeves descend. I'm completely intrigued. And psyched. I think it's essentially going to be like a sweater I saw in a Calvin Klein ad and thought was cool. So, yay. This looks not much different than the picture from a few days ago, but it's all new. I've discovered several new knitting things based on this. First, undoing color knitting's kind of a pain, because you have to keep winding all these different skeins or balls of yarn, and they're twisted together in various ways. Second, it's totally worth practicing, because this color knitting's going much more smoothly than the last version. Not that that one was bad, but this one's much more even right from the start. In other words, yes, I decided I needed to redo this larger. So I frogged the first version, recalculated the sweater size, and then re did the pattern so it'll fill up the larger space. So, cool. I'm not being quite as obsessed with it this time, so it may go a bit more slowly. Especially with that whole pesky classes starting thing. But all's well, and it'll certainly be ready by the time it's worth wearing a wool sweater. The night I realized this was too small, in order to start something before I'd made up my mind about what to do with this sweater, I also began the Orenburg shawl again. I've only done two points of the bottom row of edging; that's barely a beginning, but, again, it's not such a bad thing to start over with something like this. My knitting got much looser as I worked on the original version, and so one corner was much tighter than the rest; this will improve the whole thing (I hope). The color work sweater's been going really very well, and very quickly. Well, not so much quickly as I've been kind of obsessed with it and thus have been knitting when I should be doing other things. But I think it's too small. I went with dimensions from an oldish book, and I think babies have just gotten bigger, or something, because there's just no way. Or maybe, now that I think about it, it's just that styles have changed, so patterns used to be more fitted? But for babies? Hmmm. I could, I suppose, just add on a bit on one side... eh, I'll probably just pull it all out. That'll make me happier in the end, especially as it'll let me be a bit better with my color work the whole way through. I got better with time, unsurprisingly. The next question is whether I ought to resize the image, too, or just have it be smaller in the context of the sweater. That, I think, I'll sleep on. Last night I started working on a new project. This is a belated gift for the baby of friends in Chicago, B&R. He was born in May, but I'm just getting to his sweater now. This is largely because I like working in wool more than cotton, so doing something for him to wear this winter made a certain amount of sense. I decided I wanted to do a red sweater with a picture on it. Last week I picked up several colors of Brown Sheep's Lamb's Pride for this, which isn't a terribly baby-ish yarn, but will be warm in the Chicago winter. I did my sample swatch, and planned out the basic plan for a 6-9 month old sweater. Then I googled around and found an image to use (more or less; I kind of simplified it). I traced it onto graph paper yesterday, and started to knit right away. It may look a bit broad; I'm not doing it in the round, because I don't know how you'd do the color blocks that way (I'm sure I have a book somewhere that gives advice, but as I'm new to this color thing, anyway, I figure this is enough). But the pattern (any guesses?) is going to wrap around the side of the sweater, so I'm doing the body more or less all in one; there'll be one seam up the side, and then the shoulders. Once the body's done, I'll do the sleeves down.